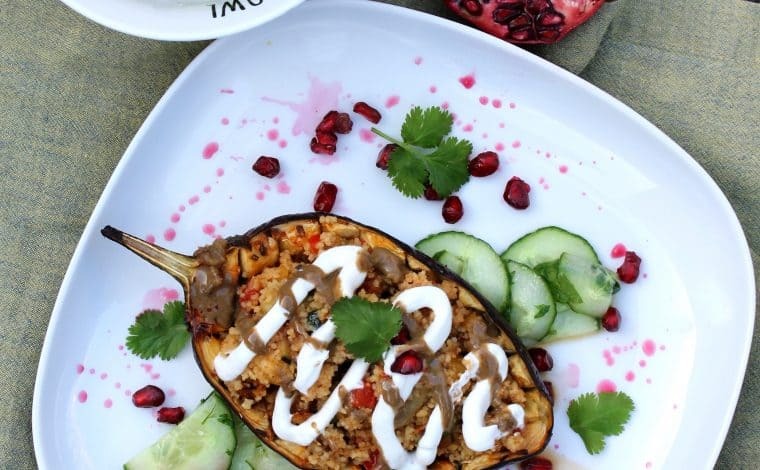 Glazed Eggplant – Moroccan style. Moritz and I are more than excited for the upcoming month. We are travelling to Marocco! 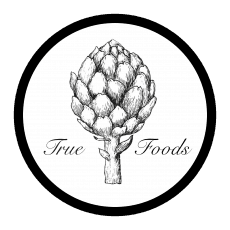 For me (Claire) it will be the first time I am visiting a country outside of the European borders and I am so curious for the tastes, smells sounds and atmospheres at this foreign continent. Today we finally had a bit of time to cook something more elaborate, so I decided to cook something typical marocain. The whole kitchen smelled amazing and fresh red of the little pomegranate rubies and the honey glaze on the eggplant made me even more excited. next start to prepare your glaze by mixing the honey with half a cup of hot water and mix until dissolved. after that add the garlic, ginger, lime, salt and harissa and stir until everything is mixed. take a paper towel and remove the water and the excess of salt on the eggplants surface. After every 10 min, open the oven and take a spoon to drizzle the sauce that has accumulated at the bottom over the eggplant, basically like you do it with roasted meat. Next, you can start with preparing your vegetables for your couscous. Therefore you cut them into cubes and star to heat up a pan with olive oil to roast the garlic and the onion until golden brown. Add the vegetables and stir occasionally, until everything is slightly roasted but still moist. Put the couscous into a bowl (it will expand by around two times) and add the cranberries or raisins followed by hot vegetable broth. Stir the couscous from time to time until it absorbed the whole broth. When the couscous absorbed the broth you can add the harissa and the vegetables and mix it until everything is well combined. Now you can prepare your cucumber salad. Therefore you want to cut the cucumber into half and into thin slices. Put it into a bowl and add the lime juice, olive oil, salt and minced coriander. Mix that. Tip: cut the pomegranate in half and take it in your hands with the open side looking down. Put a bowl under your hand and start hitting the pomegranate with the backside of a spoon. The little robins will fall through your fingers. It’s the fastest and easiest way I have seen so far. 15. Still, remember do drizzle the glaze over the eggplant. 16. Now mix the yoghurt of your choice with salt and minced mint. 17. Now you just have to wait until the eggplant is completely cooked. The glaze on the side should start to blow bubbles and becomes golden brown. 18. the last step is to take out the eggplant and scrape out the inside to mix it with the couscous. 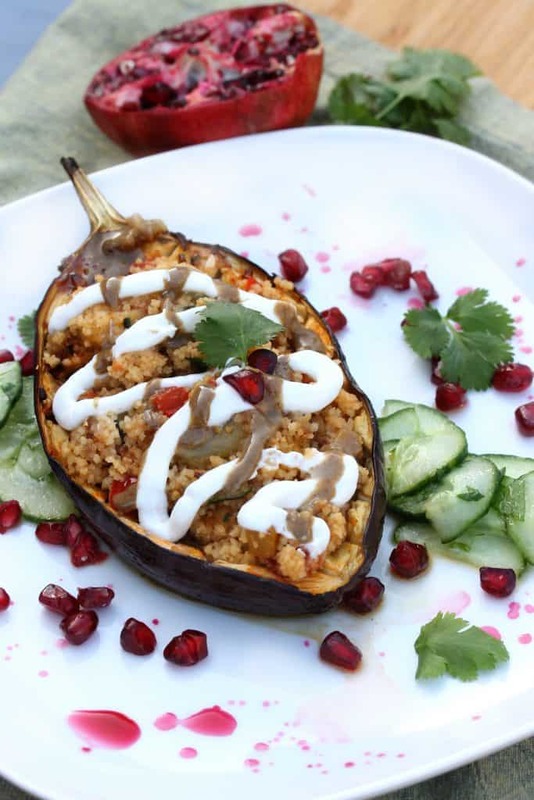 Then, put the couscous into the eggplant followed by the yogurt, some drizzles of tahini, pomegranate and garnish it with coriander and the cucumber salad.